At least 147 students were massacred when Somalia’s Shebab group attacked a Kenyan university on Thursday, the interior minister said, the deadliest attack in the country since US embassy bombings in 1998. 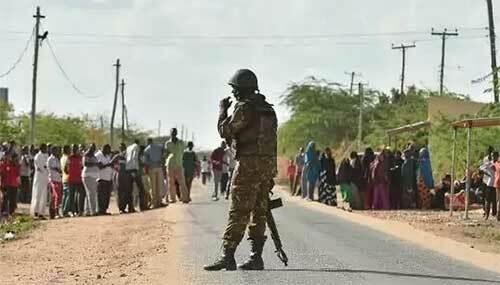 Masked gunmen stormed the university in the northeastern town of Garissa as students were sleeping, hurling grenades and shooting dead others, before setting Muslims free and holding Christians and others hostage. At least 79 people were wounded in the assault, which lasted for some 13 hours from when the first grenades were used before dawn to blast open the gates of the university, near the lawless border with war-torn Somalia. In the final hour before darkness fell, Kenyan troops stormed the student dormitory where the gunmen were holed up as explosions and heavy gunfire rang out. The siege ended late in the evening. “We are mopping up the area,” Interior Minster Joseph Nkaiserry told reporters, saying that four gunmen had been killed after Kenyan troops launched an assault on the final building. “Unfortunately, we lost… a number of lives… it is in the region of 70 students, and 79 have been injured, nine of them critically. “It is the deadliest attack in Kenya since the 1998 bombing of the US embassy in Nairobi by Al-Qaeda, when 213 people were killed. “The terrorists, 90 per cent of the threat has been eliminated… we have been able to confirm that four terrorists have been killed,” Nkaiserry added, saying that troops were scouring the campus as the total number of gunmen was not known, but that the main operation was over.